Towns Rush Past Their 2005 Peak Values! Published on May 8, 2013 in analytics and general info. Closed Tags: Boston condominium market, Boston real estate, Boston real estate sales, Boston South End condo sales. Published on April 22, 2013 in analytics and general info. 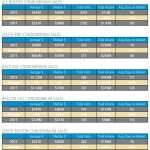 Closed Tags: Boston condominium market, Boston real estate, Cape Cod condo sales, Cape Cod luxury sales, Cape Cod real estate, Cape Cod sales. pringtime is for selling houses. The months of April, May, June and July typically account for more than 40% of all housing transactions annually, in large part thanks to weather. Published on April 9, 2013 in analytics and general info. Closed Tags: Boston condo sales, Boston condominium market, Boston real estate, Boston sales outlook, Cape Cod Luxury homes, Cape Cod real estate. Will dwindling listings derail the real estate recovery? At least for now, the answer is no. The number of pending sales across the state jumped 4.6 percent in March compared to the same time last year, the Massachusetts Association of Realtors reports. In fact, the 4,308 homes put under agreement was the best showing since March 2005, at the height of the real estate bubble, when buyers laid claim to 4,404 homes. January Sales At Highest In Five Years. Published on February 26, 2013 in analytics and general info. Closed Tags: Boston condominium market, Boston real estate, Boston sales outlook, Boston South End condo sales, Cape Cod condo sales, Cape Cod real estate, Cape Cod sales. The strong sales trend in January in just the beginning of a hot spring selling season. Timothy M. Warren Jr., CEO of The Warren Group, weighs in. Single-family home sales in Massachusetts rose more than 10 percent in January to 2,680, reaching the highest level since 2007, according to new data from The Warren Group, publisher of Banker & Tradesman. Published on October 19, 2012 in architecture and general info. Closed Tags: Boston, Boston condo market, Boston condominium market, Boston real estate, Boston South End condo sales. The tour, to be held on Saturday, Oct. 20 from 10 a.m. to 5 p.m., is a self-guided walk through six amazing South End homes starting at the Southwest Corridor and ending mid-way down Shawmut Avenue. Since the tour is at-your-own-pace and snakes around on a more than 1 mile path, the full tour can take anywhere from two to four hours. It starts at the Boston Center for the Arts. Published on October 10, 2012 in analytics and general info. Closed Tags: Boston, Boston condo market, Boston condo sales volume, Boston condominium market, Boston real estate, Boston real estate sales, Boston sales outlook. The Big Number is 21%. That’s the increase in condo sales in Boston at the end of the 3rd quarter, September 30. Combined, all Boston neighborhoods saw a 21% increase in the number of condo sales year to date, a 3% increase in the average price of a condominium sold to $545K, and an 8% increase in the median sales price to $409K. This real estate market is healthy except for the continuing decrease in inventory levels. Inventory levels of available condo’s for sale have fallen 41% to 919 properties for sale versus 1,567 at this time last year. Published on September 19, 2012 in analytics and general info. Closed Tags: Beacon Hill, Boston, Boston absorption rate, Boston condo sales, Boston condominium market, Boston real estate, Boston sales outlook, Boston South End condo sales. My good friend, excellent agent and blogger Briggs Johnson at Coldwell Banker Residential Brokerage hits it squarely on the mark with this post which illustrates the decrease in inventory year over year and its potential effect on the market. I have posted it in its entirety below. Visit his blog. In each of the last three years, home prices have increased in the spring and summer, when more people are buying homes, before giving back all of those gains and then some in the fall and winter, when activity cools. But it is beginning to look like that might not happen this year, absent a major stumble for the economy. Published on September 6, 2012 in general info. Closed Tags: Boston condo market, Boston condo sales, Boston condominium market, Boston real estate, Cape Cod, Cape Cod condo sales, Cape Cod real estate. Yes, condo documents are boring, association meeting notes are boring, budgets are boring… but get to know your new new homeowners association! Don’t be surprised by assessments, crazy leadership, unreasonable rules..get to know your HOA and then work with your HOA to make your property a better investment. Boston Condo Prices Set Record… And A Scarcity Of Units Ensues! Published on July 25, 2012 in analytics and general info. Closed Tags: Boston, Boston condo market, Boston condo sales volume, Boston condominium market, Boston real estate, Boston real estate sales, Boston sales outlook. The median price in a dozen downtown neighborhoods — they include Beacon Hill, the Fenway, the North End, and South Boston — climbed to $515,000 during the three months that ended June 30, according to LINK, meaning half sold for more than that price and half for less. That topped the previous peak of $498,500 in 2008, just prior to the nation’s financial crisis. LINK, a Boston company, tracks the downtown condominium market. The increase adds to mounting evidence that the state’s housing market is on the mend, housing specialists said.